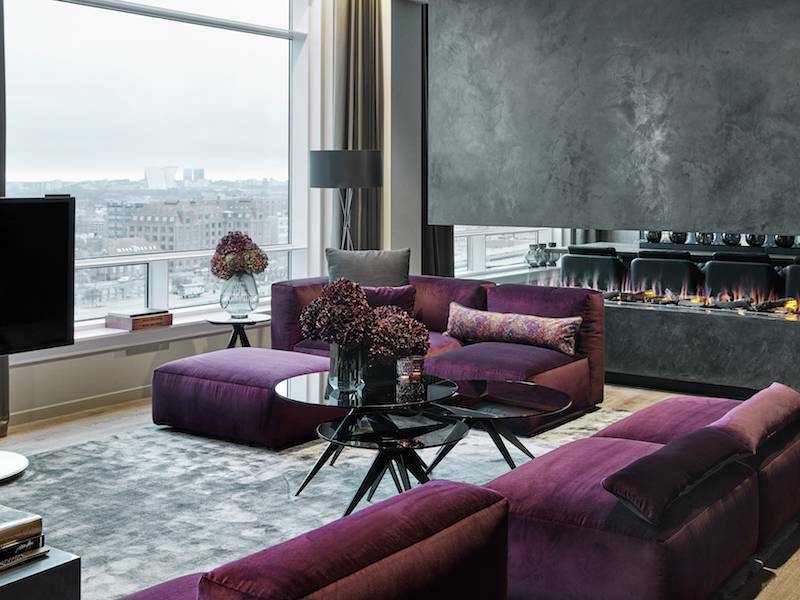 The Royal Suite, launched this week at the Copenhagen Marriott Hotel, comes with a new layout that shuns away from the classic first class lounge style towards a more bleisure-oriented clientele in search of multi-functionality, in 5-star settings. Thus, when guests start checking into the newly refurbished room #1114 on the top floor of the Copenhagen Marriott, the hotel has gone that extra mile to cater for all needs. Offering not only the Danish capital's best sea views, but also the best of both Danish and international design and interior in truly multifunctional settings, the new 170 m2 suite is expected to attract a host of guests - new and old ones - from near and far. The new hotel suite appeals to the modern traveller on the constant outlook for a place to rest or work in beautiful and peaceful settings or, alternatively, looking for the perfect place to host meetings, receptions, or private dinner parties in style - yet with a local touch. Consequently, the key design elements of The Royal Suite by Copenhagen Marriott focus on creating a homely atmosphere whilst hosting moments that matters - and on elegantly fusing 5-star international extravagance with the Danes' strong sense of minimalism and functionality. The Royal Suite also consists of two separate areas allowing for different types of needs and space for all kinds of meetings between people. "We have added a whole new level of luxury among the City's few 5-star hotels, and we look forward to welcoming both Danish and foreign guests in The Royal Suite. In addition to offering a deluxe experience and an amazing 'oasis' during an exciting leisure or business trip to Copenhagen, we have invested heavily in areas such as flat screen and sound technology provided by Danish manufacturer Bang & Olufsen. This way, The Royal Suite is not only a brilliant new alternative for staging discreet executive board meetings, management meetings or creative meetings in the heart of the city, but a perfect venue for private dinners, cocktail parties, receptions, product launches, photo or film shoots, etc." "VIP delegations, royalty, celebrities, and other select travellers will without doubt see the great potential of this 'classic first class suite reinvented' too. They're almost guaranteed to get smitten by the homely and local feel of The Royal Suite which, among other things, is brought about by collaborating with both upcoming and established Danish suppliers," Agerholm adds. The Royal Suite will be able to accommodate business people, creative heads, VIP delegations, pop stars, royals and many more and already, the interest is strong. "The suite has gotten off to a flying start and the interest among existing and new clients has been quite overwhelming. In addition to The Royal Suite's unique DNA and multi-functionality, it offers two separate areas consisting of a lounge area, kitchen space, private dining area - with optional private Chef - as well as a large Master bedroom, state-of-the-art bath/sensory spa, and a walk-in closet. What is more, suite is packed with tailor-made features and artefacts from both local Danish and International designers and artisans such as Boform, Northern Heritage, WulffWinding and Maretti - all for our guests to enjoy." "The icing of the cake is, of course, Copenhagen Marriott's unrivalled location on the inner city harbour front and its accompanying panoramic sea views of the old Copenhagen - which perfectly tops off The Royal Suite experience," adds Hotel Director, Ms. Anna Käll, who, along with the rest of her dedicated staff, is looking forward to welcome guests at The Royal Suite.